Each potential home buyer dreams of the day they’ll finally get the symbol of independence, security and prosperity: the key to the front door of their new home. Before you get that one, though, there’s another key you need to craft. Your credit score, a numerical representation of your credit history as an indicator of your ability to pay your bills, will determine a lot about your housing situation, from how much house you can afford to the interest rates you’ll receive. Your credit score is determined by three different credit monitoring agencies: TransUnion, Equifax and Experian. Each has its own method for determining which events are most important to your score, so your number may vary depending upon the agency. Paying debts off, making payments on time and using only a small percentage of your available credit make your score go up. Missing payments, opening many credit accounts or carrying a significant balance of debt from month-to-month will decrease your score. Less important than the actual score is your score grouping. Lenders tend to lump borrowers into four categories: sub-prime, near-prime, prime and super-prime. Different lenders break these categories down at different score points, but the terminology and treatment are fairly universal. Super-prime lenders get the lowest rates, because they represent the lowest level of risk for the lender. Sub-prime and near-prime borrowers will have a lower cap for the size of the loan they can take and will generally pay a higher interest rate. 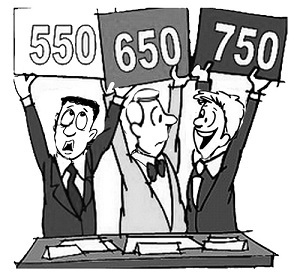 If you’re working on raising a low credit score, a good target number is 640. This will generally put you in the prime group and ensure you don’t have to pay extra on your mortgage because of credit. If you’re building good credit, 740 is generally the lowest super-prime score, which will give you access to some of the best rates and terms available. If you’re going house-hunting in the next year, there are three steps you can take right now to improve the terms of your mortgage. Check your credit score, take steps to raise it and manage your loan in other ways. Taking these three steps will put you on the fast track to affordable home ownership! You can check your credit report for free once a year at annualcreditreport.com. Note, though, that there may be a nominal fee to receive your actual score along with the report. There are many similar websites, but many of them will charge you. Annualcreditreport.com is the site created by the three credit companies to provide consumers with transparent access to their financial information. If your score isn’t at the level you think it should be, there may be errors or inaccuracies that are dragging down your good name. Look for accounts you don’t recognize or balances that are not up-to-date. You may even catch an identity thief red-handed! The report comes with instructions for challenging any item. In most cases, you can leave a note for lenders in the file explaining the item under dispute. There are no simple tricks to bump your credit score in advance of a mortgage. You need to develop a 6- to 12-month plan to boost your credit score before getting your mortgage by making sound financial decisions. Demonstrate to lenders that you can use credit responsibly, and your score will increase. One of the biggest drags on a credit score is percentage of utilized debt. If you’re carrying a balance on credit cards, this tells lenders that you may be using credit to pay for your day-to-day expenses, and that lending you more money would not be a smart move for them. Getting balances to zero should be goal number one! Also, take care that you don’t make any major purchases using credit right before you attempt to qualify for a mortgage. Even if you’re expecting a major windfall, such as an overtime check or a tax refund, creditors don’t see that on your report. Hold off until you have the cash in hand before you splurge on a new TV or car! If it’s a lack of credit history that’s hurting your score, many lenders offer “credit builder” loans. These involve borrowing a small amount of money and making regular installment payments on it. Parents can frequently take out these loans on behalf of children to help them build a stronger credit history. If your credit score is low, and there’s nothing you can do about it, you may need to take other steps to get a better position on a loan. You might try boosting your down payment or shopping for less expensive houses, so you’re borrowing a smaller sum of money. A co-signer, another responsible party willing to take on the risk of the loan, can also improve your terms. If your debt is a serious problem, perhaps moving into a new house isn’t a good short-term priority. Focus instead on paying off debt and saving up for a down payment. This can keep you from getting stuck with a house payment you can’t afford before you’re ready for it.